The Colorado Avalanche won the draft lottery on Monday night leaving the Nashville Predators with the No. 4 overall pick in June’s draft. It’s the first time since 1998 – when Nashville selected David Legwand, No. 2 overall, as the first draft selection in franchise history – that the Predators have selected in the top-five of the draft. Defenseman Seth Jones and center Nathan MacKinnon are expected to be the first two players chosen in this year’s draft, but here are four players the Predators will consider drafting with the fourth overall pick. Cause for celebration: Barkov is potentially the franchise center Nashville has lacked its entire existence. At the age of 17, he is posting nearly a point per game playing against grown men. Barkov is a productive two-way center who excels defensively and would fit naturally in a Barry Trotz system. He’s also ranked as the No. 1 European skater in the 2013 draft, which would give Nashville the top rated European from the last two drafts (Filip Forsberg, ranked No. 1 in 2012). Cause for concern: Barkov injured his shoulder in March ending his season prematurely. The injury is not considered serious long-term. Barkov’s skating, or more specifically speed, has also come into question. Cause for celebration: Drouin is arguably the most exciting player in this year’s draft class. His skill set is elite, his hockey IQ is high, and his vision is unmatched, as evidenced by his 41 goals and 105 points in just 49 games this season. These attributes really set him apart from other draft-eligible players. 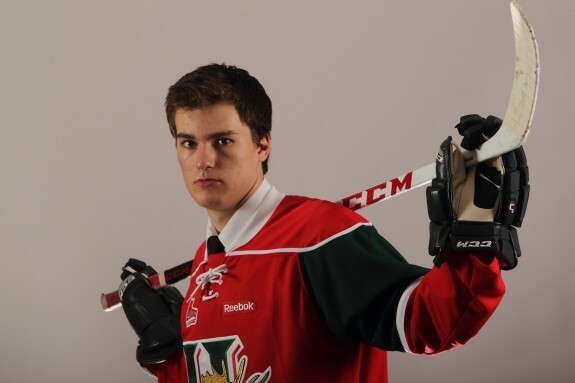 Drouin is projected to go in the first three picks, but could fall to No. 4 if the Tampa Bay Lightning elect to draft Barkov or a defensemen like Darnell Nurse. Cause for concern: The only question mark attached to Drouin is his size. Can he hold up in the NHL against bigger forwards and defensemen? Drouin is undersized, obviously, but his hockey sense and creativity should allow him to eventually dominate at the NHL level. Think Patrick Kane or Martin St. Louis. Cause for celebration: Lindholm is another highly regarded European center who would fill a huge need for the Predators. He is probably what you would consider a prototypical Predator playing a relentless, defensive-minded style of tw0-way hockey. That said, he certainly has potential to be a point-producer at the NHL level. Because of his well-rounded game, Lindholm is considered one of the safest possible picks in the 2013 draft. Cause for concern: Lindholm doesn’t really have any weaknesses in his game, but his offensive upside may be limited in comparison to the other top prospects available in the top-5 of this draft. Cause for celebration: Monahan is another strong, two-way center. He has good size, he’s a great face-off guy, he plays a smart and responsible game, he was the captain of his junior team this season, and he increased his point-per-game scoring this year despite a lack of talent around him. Best guess: Aleksander Barkov will hear his name called when Predators announce the fourth pick in the 2013 NHL Entry Draft this June.